Snoring is a problem which is not often thought of as a serious condition. However, it can have a major, negative impact on the quality of life of people who snore and their families. Regular snoring can prevent good quality sleep, this not only causes tiredness but also has a knock-on effect on many different aspects of health. There are many ways to reduce snoring, including making some simple lifestyle changes and strategies such as earthing. Earthing is a relatively new concept which has been shown to help improve sleep. It uses the earth’s natural electrical charge to regulate biological rhythms, improve sleep and increase daytime energy levels. Snoring happens when the muscles that usually hold open the throat relax during sleep. This causes the airway to narrow and vibrate. The sound that you hear when somebody snores is these vibrations and the more their airway narrows, the louder the snoring will be. Snoring is more common in people who are overweight. This is because having more fat around the neck area causes more narrowing of the throat. It is more common in men than women, and the risk of snoring increases as you reach middle-age. One of the most obvious side effects of snoring is daytime fatigue. When you, your partner or other family members are unable to sleep due to snoring, they will feel more tired during the day. This can lead to problems such as lack of energy, poor concentration, and memory. People who have had their sleep disturbed by snoring are more likely to have accidents as their mental alertness may be impaired. It is especially dangerous to drive or operate machinery if you have daytime fatigue caused by snoring. When you are tired during the day, it can be tempting to take an afternoon nap. While a short nap can be refreshing, longer naps can prevent you from sleeping properly at night. This results in a vicious cycle of tiredness and lack of sleep, which can be difficult to break. Sleep apnea is a condition in which the muscles of the throat relax so much that breathing stops temporarily. This causes you to wake suddenly to allow breathing to start again. This can happen up to 10 times during one night. People with sleep apnea may not be aware of this happening, but will feel fatigued during the day as their sleep has been so disturbed. It can also be frightening for the partner of the person suffering from sleep apnea as they witness them gasping for breath throughout the night. As well as causing tiredness and fatigue, sleep apnea is associated with an increased risk of developing other serious health problems. These include diabetes, high blood pressure, heart attacks and strokes. Obesity is one of the leading causes of snoring and sleep apnea. The pressure exerted on the airways by excess fat around the neck causes the airways to narrow and results in snoring. However, the link between snoring and obesity is far more complex than this. Lack of sleep can lead to weight gain. This is because two of the hormones involved in appetite control, leptin and ghrelin, are regulated during sleep. When your sleep is interrupted due to snoring, these hormones are thrown out of balance. This can lead to excess hunger and food cravings the following day. Sleep apnea has also been linked to metabolic syndrome. Metabolic syndrome is a condition characterized by insulin resistance, high blood pressure, high blood lipids, high cholesterol and abdominal obesity. It is thought that sleep apnea affects levels of adiponectin, a protein which plays a part in the development of metabolic syndrome and diabetes. Snoring can often be reduced by making some simple lifestyle changes. Losing weight is one way in which snoring can be improved. Eat a healthy, balanced diet including plenty of fresh fruit and vegetables and some lean protein. Avoid refined sugars and don’t eat too late in the evening. Take some regular exercise to increase your muscle mass and reduce body fat. Reducing your intake of alcohol can also help. Try to avoid drinking alcohol within four hours of bedtime. If you are taking medication that you think may be contributing to your snoring, talk to your doctor about finding an alternative. Stopping smoking is another way to reduce snoring and improve your health in general. If you have allergies, keep them at bay by taking your medication regularly and avoiding any known triggers. You might consider installing an air purifier in your bedroom to further reduce your exposure to allergens. Finally, try to sleep on your side rather than your back. Experiment with the position of your pillows. You might want to try placing one under your arms or legs as well as your head. This may feel unnatural at first but if you persist over the course of a few weeks it should become more comfortable. Most treatments for snoring involve widening the airways in some way or another. Adhesive strips are available to keep the mouth closed and the nasal passages open. Nasal sprays and antihistamine medication can be used to reduce allergies and inflammation in the nasal passages. All of these treatments encourage you to breathe through your nose rather than your mouth and improve snoring in that way. A device known as a mandibular advancement splint can be used to push the lower jaw forward slightly. This has the effect of opening the airway and making breathing easier. These are made to measure and need to be fitted by a dentist or oral surgeon. Surgeries to improve snoring include having your tonsils removed if they are enlarged, or having a procedure to stiffen the roof of your mouth. This prevents snoring by reducing the vibrations in your throat. It can be done using laser surgery, microwaves or an injection. It must be carried out by a professional and can be painful. Sleep apnea can be treated using a pump and mask to aid breathing during sleep. This is known as a continuous positive airway pressure (CPAP) machine. 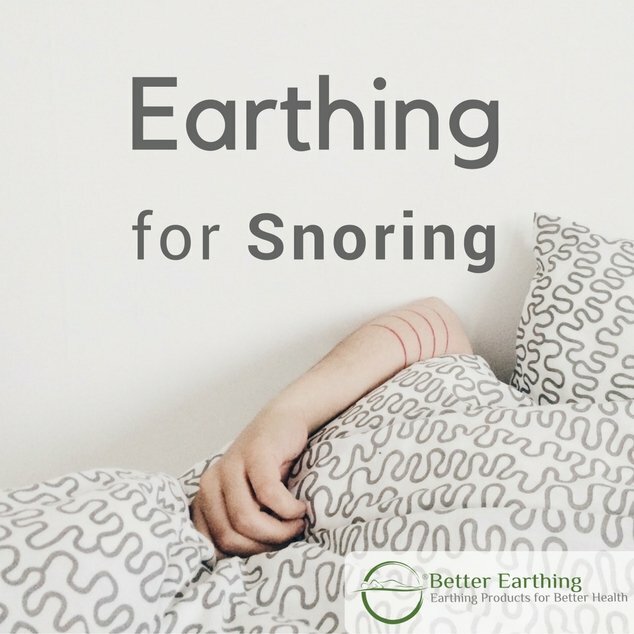 Earthing is another technique which may help reduce snoring. Earthing, also called grounding, simply describes bringing the body into conductive contact with the earth. This has a number of benefits including decreasing inflammation and improving sleep. The earth’s surface carries a negative electrical charge due to the presence of free electrons. When you allow yourself to come into contact with the earth, this charge is transferred to your body. These free electrons have an antioxidant, anti-inflammatory effect which allows your biological rhythms to be reset and relieves the symptoms of a wide range of conditions. Inflammation has been linked to sleep apnea and snoring. Inflammation is a natural response to infection or injury by the body. When an invading pathogen is identified by the immune system, white blood cells are summoned to the area to destroy it. This triggers a cascade of chemicals to be released which cause symptoms of redness, swelling, heat and pain. Cortisol is a hormone which has anti-inflammatory effects within the body. Earthing has been shown to alter blood chemistry and effectively reduce inflammation. It reduces the numbers of some white blood cells and regulates cortisol levels. Earthing can be done simply by standing barefoot on grass, sand or unpainted concrete, or using a special indoor earthing sleep system for use overnight. One of the ways in which earthing helps to improve sleep is by regulating cortisol levels. Cortisol is secreted by the adrenal glands and is responsible for waking you up in the morning and mental alertness throughout the day. It should be at its highest level at around 8am and gradually decrease as the day goes on. If cortisol levels are too high in the evening, this can interfere with sleep. This research study looked at the effects of earthing overnight on sleep, stress and pain. It showed that earthing during sleep normalized cortisol levels throughout the 24 hour period. Its subjects reported falling asleep more easily, waking fewer times during the night and having more energy during the day. They also had reduced levels of stress and pain. As well as interfering with sleep, cortisol has been linked to weight gain. Being overweight is a major factor in snoring and sleep apnea, and reducing body weight can help to resolve these problems. When cortisol levels are high for long periods this can create extra insulin or cause insulin to stay in the bloodstream for longer. As shown by this 2010 study, high cortisol levels lead to insulin resistance which contributes to weight gain and increases the risk of diabetes. Cortisol levels can be reduced by low intensity exercise combined with earthing and good quality sleep. This, in turn, reduces the risk of obesity and all of its associated health risks. You can begin to feel the positive effects of earthing simply by going outside and walking barefoot on the surface of the earth. Within a few seconds, you will feel your muscles begin to relax as your nervous system is calmed. To enjoy the benefits of earthing on a daily basis, consider earthing bedding for use overnight. This may improve your sleep quality, reduce snoring, so that you wake up feeling rested and refreshed each morning.